Training The Chest: What You Need To Know! We know to go as heavy as possible with good form to get maximum muscle overload and hypertrophy. We also know that routines need to switch often to prevent the muscle adaptation process. The chest is such a noticeable muscle group. it is always first to walk into a room and therefore it is very important in a balanced physique to have an impressive big chest. The chest is used in pushing and wrapping your arms round something. The chest is made up of two main muscles. The Pectoralis major is that big muscle that covers each half of the front of your chest. One of its jobs is to turn your arm inward. Its other job is to help pull your arm forward and down. Pectoralis minor is directly under pectoralis major. It's attached to your third, fourth and fifth ribs at the bottom, and at the top it's attached to the front of your shoulder blade. It helps pull your shoulder blade down, and it helps hold your shoulder down when you have to push down with your hands. Chest is a muscle that is hit best by heavy pressing movements. as the chest looks best with mass and the best way to get mass is by using heavy pressing movements. People often think that the chest is a large muscle group but compared to the rest in the body it is really only a medium sized muscle group. therefore not needing too many sets. For me and the volume I like using I always aim for 9 sets. after warm up. Others like more and others like less.but for me it seems to be the perfect number. Chest is best hit form 3 angles. upper - incline, middle â€" flat, lower - dips. but of course they are not separate muscles. 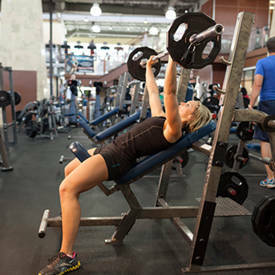 Doing chest should be done using free weights sure there are other ways of doing it on machines or even a smith machine (avoid not proper range of motion for pressing) but the free weights are far better for adding mass as they incorporate stabilisers. Where as reps goes everyone is different buy I have found that lower reps really help me add mass and strength so I train chest with 6 reps. Regarding what angle to incline at anywhere between 10 - 30 degress is perfect but higher than that then it would be too much to do with shoulders. Chest problems are very common and there can be so many reasons behind this. For a good bench press you must build strength in shoulders, triceps and back. another problem on either up or down in the press could that you are too slow try and get a perfect tempo for you. Another thing could be technique. To get tight, you want to pull your shoulder blades together and shrug into your traps, fill your body with air, and drive your heels into the floor. You want to visualize pushing your body away from the bar as you press up. The bar is too heavy. try to start lighter with good form and then you will soon be increasing if your technique is good. The key to training greatness is finding your weak points and attacking them. Regardless of the exercises diet and rest take a major part into how you develop. Pause Press - Regular flat bench, pause for 2-3 seconds at the bottom of the bench. Good for strengthening lower part of bench. Floor Press - Bench press done on the floor in the power rack. works triceps and top part of bench... but it does depends on the size of chest/back and length of arms. Dumbbell Work - Dumbbells are great for teaching you how to press and also great for building stability in the shoulder and lat muscles..
Dynamic-effort Method - This method is best defined as training with sub-maximal weights (45 to 60%) maximal velocities.. The key to this method is bar speed..
Board Press - Place pieces of wood on your chest and bench; kinda like limiting the ROM to work certian parts.. ideal for helping the upper part. Learn more here. 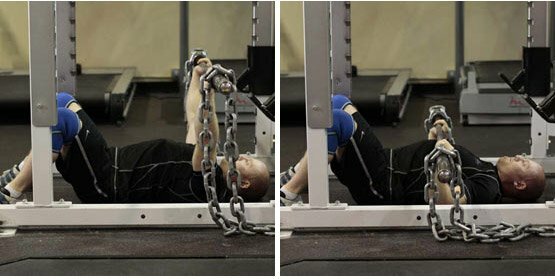 Chains â€" Adding chains to the ends of the barbell at the bottom of the lift the chain is almost all deloaded so very little impact. as start pressing it back up the chain lifts off the floor and now you pressing more weight. good for mid-point of bench. Learn more here. Pin Presses - Done in the power rack, set the pins too limit your ROM(6-8in) from lockout of your bench press, since it a short ROM you can use very heavy weight, more than your max, hitting your triceps hard and helping your lockout on the bench press. This question has been asked about a hundred times, its all about genetics. That's just how your chest grows there is nothing you can do about it whatsoever other than keep adding mass to the chest so that it fills out. Anyone who tells you to do flyes/crossovers or anything else wrong there is no such area of the chest. 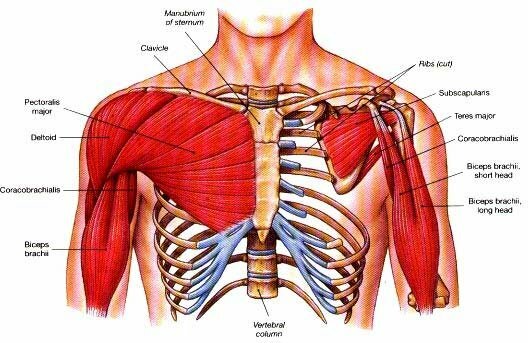 There is NO such muscle as the inner or outer head of the pectorials. Learn how to properly learn over 300 exercises with Bodybuilding.com's huge exercise database, click here! Word of warning for the end. Don't listen to what flex or other magazines say about chest most is wrong. A'right, so we all know one of the basic tips given is to pretend to tear the bar apart to involve the tricep more. Well, something i've seen w/ myself and others is that you grab the bar, pretend 100 tear it apart, then unrack it (w/, w/o help). Once unracked though, there's a tendency to forget to continue to do this tearing motion throughout the movement... trust me, it makes a difference. This is a very important and often overlooked aspect of great bench pressing. While pressing you have to create the most stable environment possible. This can't be done if most of your shoulder blades are off the bench. The bench is only so wide and we can't change this, but we can change how we position ourselves on the bench. When you pull your shoulder blades together you're creating a tighter, more stable surface from which to press. This is because more of your body is in contact with the bench. The tightness of your upper back also contributes. These techniques also change the distance the bar will have to travel. The key to pressing big weight is to press the shortest distance possible. This is another misunderstood aspect of pressing. You want the pressure around the supporting muscles. This is accomplished by driving your feet into the floor, thereby driving your body into the bench. Try this: Lie on the bench and line up so your eyes are four inches in front of the bar (toward your feet). 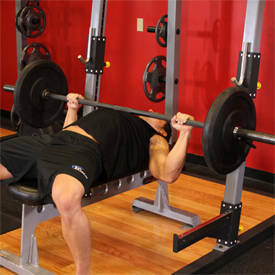 Now using your legs, drive yourself into the bench to put pressure on the upper back and traps. Your eyes should now be even with the bar. This is the same pressure that needs to be applied while pushing the barbell. Try to push the bar toward your feet. The shortest distance between two points is a straight line, right? Then why in the world would some coaches advocate pressing in a "J" line toward the rack? If I were to bench the way most trainers are advocating (with my elbows out, bringing the bar down to the chest and pressing toward the rack) my barbell travel distance would be 16 inches. Now, if I pull my shoulder blades together, tuck my chin and elbows, and bring the bar to my upper abdominals or lower chest, then my pressing distance is only 6.5 inches. Now which would you prefer? If you want to push up a bar-bending load of plates, you'd choose the shorter distance. Here's another important aspect of pressing in this style. By keeping your shoulder blades together and your chin and elbows tucked, you'll have less shoulder rotation when compared to the J-line method of pressing. This is easy to see by watching how low the elbows drop in the bottom part of the press when the barbell is on the chest. With the elbows out, most everyone's elbows are far lower than the bench. This creates a tremendous amount of shoulder rotation and strain. Now try the same thing with the elbows tucked and shoulder blades together while bringing the barbell to your upper abdominals. For most people, the elbows are usually no lower than the bench. Less shoulder rotation equals less strain on the shoulder joint. This means pressing bigger weights for many more years. I've always been amazed at trainers that suggest only doing the top half of the bench press, i.e. stopping when the upper arms are parallel to the floor. This is done to avoid the excess shoulder rotation. All they have to do is teach their clients the proper way to bench in the first place! This is probably the most important aspect of great pressing technique. The elbows must remain tucked to keep the bar in a straight line as explained above. Keeping the elbows tucked will also allow lifters to use their lats to drive the bar off the chest. Football players are taught to drive their opponents with their elbows tucked, then explode through. This is the same for bench pressing. Bench pressing is all about generating force. You can generate far more force with your elbows in a tucked position compared to an "elbows out" position. The most important aspect of this is to keep the barbell in a direct line with the elbow. If the barbell is behind the elbow toward the head, then the arm position becomes similar to an extension, not a press. This is the only way you can maintain the "barbell to elbow" position as described above. You may have heard the advice, "Bring it low" at almost every powerlifting competition. This is the reason why. Once again, the barbell must travel in a straight line. For maximum attempts and sets under three reps, you must try to hold your air. Everyone must learn to breathe from their bellies and not their chests. If you stand in front of the mirror and take a deep breath, your shoulders shouldn't rise. If they do you're breathing the air into your chest, not your belly. Greater stability can be achieved in all the lifts when you learn how to pull air into the belly. Try to expand and fill the belly with as much air as possible and hold it. If you breathe out during a maximum attempt, the body structure will change slightly, thus changing the groove in which the barbell is traveling.